Zuni Indian jewelry has changed in appearance and purpose greatly over more than a thousand years. Modern techniques have certainly influenced contemporary Zuni Indian jewelry, yet essential traditional characteristics have been maintained in the elements used to create the jewelry, and in the iconography depicted. The ancestors of the Zuni people began making jewelry in ancient times. The art of making Zuni Indian jewelry has a rich, one-thousand-year history. The first kinds of Zuni Indian jewelry, often beaded necklaces, were made exclusively from shells including conch, clam, mother of pearl, abalone and oyster. These early pieces of jewelry were used as currency for trading purposes. A major change for Zuni Indian jewelry occurred in the late 1800s, when the Zuni learned the art of silver-smithing. 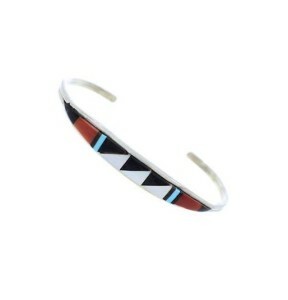 Contemporary Zuni Indian jewelry is made from traditional elements, such as shells, turquoise, and silver. Petit point jewelry is defined by tiny hand-cut stones. These stones are oval-shaped, pear-shaped, rectangular-shaped, round-shaped, or square-shaped. Needle point jewelry is defined by the elements of the piece being needle-shaped. Inlay jewelry is defined by gemstones inlaid in silver jewelry. While Zuni Indian jewelry is beautiful, not all Zuni art was mere decoration. Some pieces, such as fetishes, were used for ceremonial purposes. Fetishes are carvings inlaid with gemstones or other elements, shaped to depict various guardian animals. Zuni necklaces, as mentioned before, were used for trading purposes. Contemporary Zuni Indian jewelry is sold for commercial purposes, but still pays homage to ancient craftsmanship and beliefs, using many of the same elements and religious iconography that were used in the past. Due to its excellent craftsmanship, Zuni Indian jewelry is currently very popular. The Zuni people have perfected their art over the centuries, truly becoming master silversmiths, stone-cutters and jewelry designers. Sales of this traditional Zuni art is a major source of income for the Zuni people. The popularity of Zuni Indian jewelry is important, not only in providing economic security for many of the Zuni people while many in other tribes live in poverty. The popularity, and marketability, of Zuni art and jewelry has helped to keep Zuni traditions alive, though certainly modern influences have made their mark on the art. Zuni Indian jewelry has a long and rich history. The current and continuing popularity of this jewelry, and its marketability, help to ensure that this traditional Zuni art, in one form or another, will continue to be passed down from generation to generation.